"Old School ARC welding...thats the ticket "
What is a Tig Finger? Why did this simple job turn into an arc welding project? Normally, Mig welding is the choice for fabrication jobs like this one. It was a simple stand for a bender. A stick of 3 1/2" tubing with a flange plate welded on one end and a mounting base plate welded to the other...simple as they come. So why Stick weld, when mig welding would be faster and easier? ..or just whip out the stick rods and weld right over all the junk and call it good. Sometimes, good enough really is good enough. A 7018 stick rod burned in nice and hot will definitely hold till the cows come home on a stand for a tubing bender. I dont care if a 6 foot cheater bar is used for bending, these welds aint gonna give. So instead of all that extra work for nothing, I decided to Stick weld this job. Anyway, The Everlast Powerpro 256 tig, stick, plasma combo welder was already there, hooked up and ready to rumble. I keep it set up for tig welding at my machinist friends shop. But swapping it over for stick welding only takes a few seconds...so thats what I did. All I had to do was unhook the tig torch and plug in the stick leads. The square tubing my friend wanted to use for this arc welding project was 3 1/2" x 3/16" wall and the flange mounting plates were 1/4" thick. 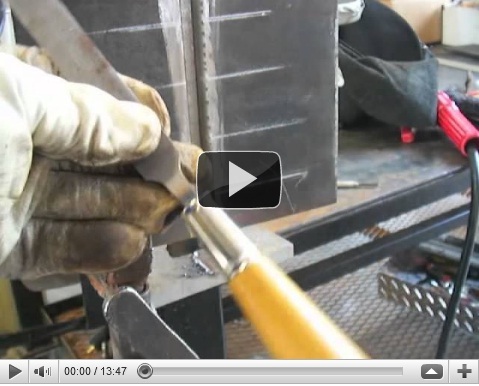 In this arc welding project video, I show how to center the tubing, tack weld, get it square, along with some arc welding tips for how to weld it without a bunch of stops and starts ...except on the corners. I also show a tip for another way to prop for arc welding using a tig finger. One thing every welder needs to know is how much tack welds draw...how much they will pull a piece out of square. Knowing how much the tack welds pull lets you pre position a piece to allow for that and lets you get things square and plumb without cutting tacks loose and reworking. Thats what you wind up doing if you dont allow for the tack welds drawing. I can tolerate certain things not being perfect but things being out of square and out of plumb...drives me to distraction...I hate it. What is the Arc Force / ARc control knob and what does it do? The arc force/control lets you adjust whether you have a soft buttery arc or a digging arc. Arc voltage drops as the arc gets tighter. When you set the arc force knob high , the machine makes the arc dig more by sensing a drop in voltage when the rod is about to stick...an arc welding machine with arc force control compensates when the rod is about to stick by increasing the arc voltage. You can literally jam the rod in as tight as you like without sticking if you have it hot enough with the arc control set high. Setting the arc force knob low, gives a soft buttery arc.If you were hardfacing backhoe bucket teeth, a soft arc might come in handy to prevent that hardface rod from diluting too much with the softer base metal. Who wants to pay an arm and a leg for hardface rod only to have it turn out soft because too much base metal was melted? Today , for this arc welding project, I set the arc force to dig because the 7018 rods I was using were old and had been sitting out in the air for like 2 years. I knew they would have a tendency to stick if I didnt set the machine for a digging arc.